I’ve been waiting to post this and I think now is the time. I also have a few more posts that need to be uploaded but they will be retro-dated so as not to blow up your newsfeed. I’m not ready to share this news just yet, but I’m typing it up now while it’s fresh in my mind. 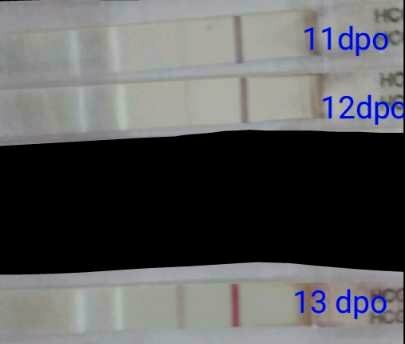 Well, I woke up for church at 11dpo and as I was getting ready, I took a test. I went on getting ready and finally realized I hadn't checked the test. I thought to myself "Not like I really need to. It's just a formality." But what was that? Was that an evap? An indent? Was there any pink there at all? 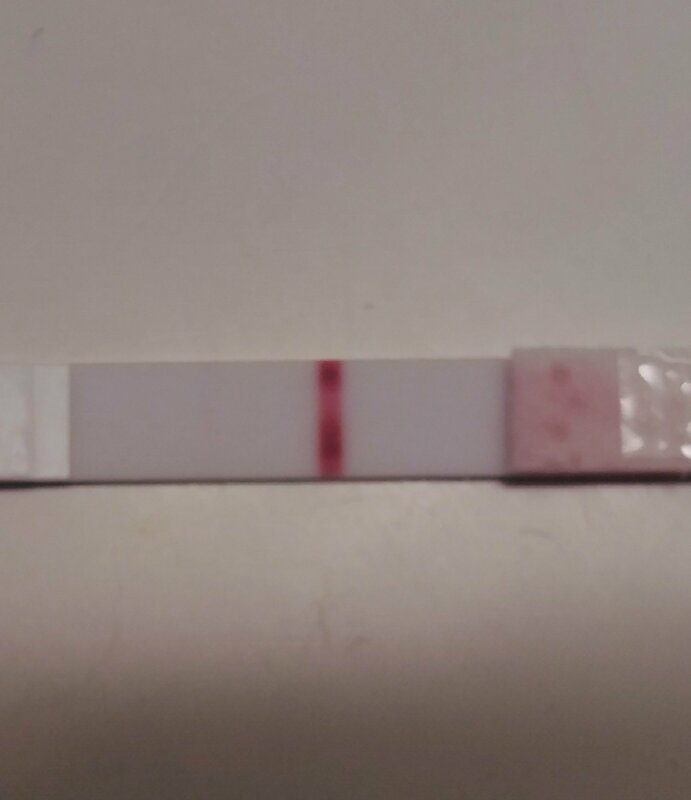 I texted my bff (but couldn't send her a pic because the NOT line wouldn't show up at all, even inverted) and I told her not to get excited and that I'd buy some real tests after church. This was just a $0.20 internet cheapie, afterall. The faint Dollar Tree test I took after church. At first glance, it almost doesn’t even look positive. But it’s there on the left! I thought I'd cleaned up the wrappers from the test (Actually, I took a second one. Hey, they're only $1.) but I accidently left the plastic on the bath and my mom found it. Lucky it was her who found it and not one of my siblings because I was not ready to share the news. So, we got home that evening and the tests were so faint that DH wasn't really sure they were real. Therefore I set off for the store and bought a digital. I dipped it and capped it and then sat on the couch next to him to wait the agonizing 3 minutes for results. There was that word! "Pregnant" 🙂 I just couldn't stop laughing! DH kept saying "We're gonna have to buy a 5 bedroom house!!" So much more official than a faint line! The next morning I took another of the $1 tests and it was much darker. I called the Dr's office and they sent in lab orders for hcg and progesterone. I didn't get the results back until the next day (today). My test this morning showed some progression, so I hope that everything is well in there. My beta at 12dpo was 28 and progesterone was 14.7 - both a bit lower that my Dr's office would like to see initially but it's early and may well be fine. Progression... 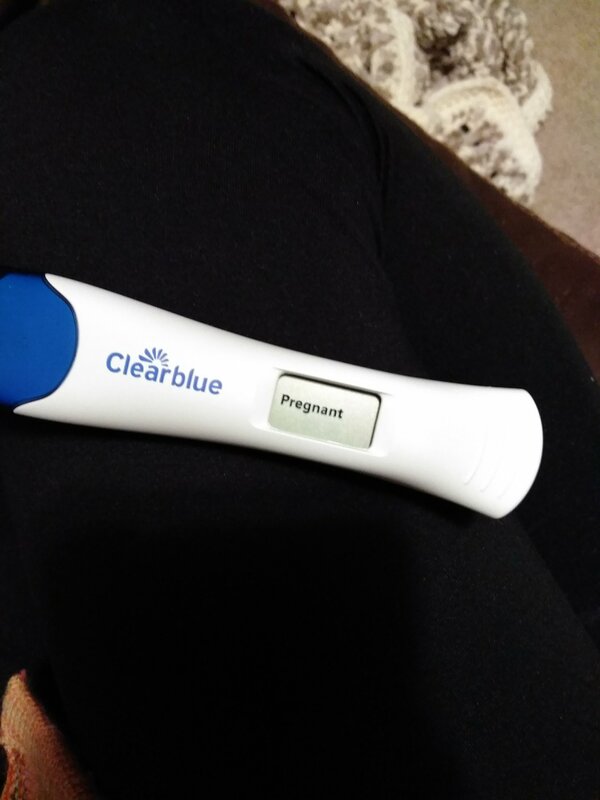 The 12 dpo test was with a beta level of 28. Which means the day before was probably much less. $1 tests for the win! Thankfully I have a bottle of PIO leftover that is unexpired, so I was able to start PIO injections today at 13dpo. I started Lovenox on Sunday morning as soon as I had the first faint test. I figured I shouldn't wait as I should have been taking it anyway. So, that's the story for now! I go again tomorrow (Wed) Lord willing for a repeat beta and progesterone and again on Friday. The day after tomorrow (New Year’s Eve!) is our ultrasound appointment, Lord willing. I can’t believe how fast the time has went by. Usually it just drags on and on but I’m so busy, I hardly have time to think about it. If I do dwell on it, I feel a little nervous, to be honest. Definitely feeling the morning sickness. It’s actually been sort of ok in the morning as long as I hurry up and eat something. But boy, 10am onwards is much more queasy with waves of full-on nausea. I’ve been getting by with b6 and unisom (doxylamine succinate) but the last 2 days I’ve had to give in and take a half dose of zofran so I can function enough to take care of the kids and actually get off the couch. The rest of the day is nauseated but evening (as usual) is typically the worst. Which is good because DH is home a lot of the time by then and I can rest! My bff sent me some natural ms remedies to try. THANK YOU J! They do seem to help, if I use them before the nausea gets out of hand. • Exhausted, as in, I just want to live on the couch. Current fantasy is me checking into a hotel ALONE and sleeping with absolutely no sense of time. Then eating and going to sleep again. Ya, I know… Lame. That’s pretty much it. I’ve lost a couple pounds, which is fine because I have plenty to spare. I weighed about 152-153. I’m currently 150. My go-to foods are definitely carb related but my appetite is super small. Everything sounds gross for the most part but salty stuff sounds better. Celery, granny smith apples, ravioli and lemon water are all acceptable for now. Orange essenced seltzer water is also ok.
Over the Christmas parties, I found it necessary to break the news to a few more people. The bloating was UNREAL (but it’s gone now) and as soon as my sister saw me, she could just tell. I wanted to tell her anyway since I barely ever see he in person since she moved away. I told my others sisters too so, my sisters know. I told my dad. We told DH’s Grandma and she yelled the news at the entire family. Lol… It’s ok. I still have 2 relatives I have to tell before the news becomes public. This is always hard because they have been struggling with infertility for 18 and 8 years… There’s no gentle way to break the news. That’s why I’m waiting till after the ultrasound to tell them but definitely telling them before it leaks out. Anyway, yeah… Not much else to update at the moment. Just hoping and praying for a good ultrasound appointment and getting the loan processed for the land we are trying to buy. It’s been hard working with the banks through the holidays but we’re getting there! Dear God, thank You for this unique time in my life to be so busy but so blessed. Thank You for choosing to bless us with this experience again. Please protect and keep this little one healthy. In Jesus’ name, amen. At 5+2, the occasional queasiness in the evenings gave way to an occasional wave of nausea. As of now, I wake up in the night queasy. In the morning I’m queasy. And throughout the day I am queasy with waves of more intense nausea. Yesterday was super rough. We were supposed to go to my In-laws’ house at 4:30pm for Christmas. I woke up around 8-8:30am and noticed some aching pain in my right side, low in my abdomen. Throughout the day it would ossilate between dull aching and sharp pain that would radiate through my back and down my leg. It felt a lot like an ovarian cyst. Then I started having a lot of cramping across the lower front of my belly. This is super common in early pregnancy, for me at least. The cramping alone wasn’t concerning. But the worsening pain in my side was. So finally at almost 2pm, I decided to drive to the ER to get checked. I made DH stay home with the boys so he could take them to his parent’s house for Christmas. I absolutely did not want them to miss out on the fun with their grandparents and cousins etc. By 5pm, the ER had run bloodwork, urine tests and done an ultrasound. The bloodwork was good. No sign of appendicitis. They said the ultrasound showed a pregnancy in the uterus. I don’t know if they saw a baby but it’s still so early, they might not have. There was a gestational sac and yolk sac. I’m not sure how they measured but I can’t tell you how relieved I was to know that it was not ectopic. Obviously that was my primary concern as I’m at the point in pregnancy where an ectopic may start to show symptoms. The urine test showed a UTI. I should have known! In fact, 2 nights before I had woken up with pain and burning but it went away during the day so I figured it was fine. That doesn’t explain the pain in my side, although UTIs do cause me to cramp. So they sent me home with an antibiotic and I was able to get to my In-laws’ house just an hour late. Naturally, I told DH just to tell them the truth when they asked where I was. So they know my secret now and I’m fine with that. 😉 I’d still like to wait until we have a good ultrasound before I tell the rest of my family. Thankfully the pain has been gone so far today. It was there all yesterday evening but finally calmed down when I went to bed. For now I’m just taking it easy, drinking lots of water (still have super thirst!) and taking my medicine. Hopefully I am well all through Christmas with no more drama! I have been so chill this time compared to my other pregnancies and I just REALLY want to be able to keep feeling relaxed and happy about the whole process. I’m glad it was *just* a uti. Something I have lots of experience with and nothing to get too worried about. Dear God, You gave life to this tiny person inside me and You know what they need. Please continue to protect and sustain them according to Your will. In Jesus’ name, amen. Some people will hate me for this post and I debated even posting it because of that. But I do ask that you don’t post any mean comments. They will be deleted. Feel free to disagree, but please be kind and respectful. This decision is plenty hard enough… Harder than I ever thought it could be. And not just for me, but also for my children. We have decided to rehome Rocky. I talked at length with the woman from the shelter where we adopted him and she said we will find Rocky a home in exchange for adopting a dog that will suit our family better. Until they have a dog available that she thinks would be good with kids, we will keep Rocky so he isn’t living at the shelter. I absolutely do not want him to spend any time there at all, if possible. Other dogs stress him out very badly. I sent her pictures and she was showing them to a man who was looking for a dog like Rocky. I’m waiting to hear back from her. We adopted him from the shelter on Jan 26th this year. Almost a whole year later and things just keep getting worse between the kids and Rocky and us. He was a puppy when we got him and we had thought that surely him growing up with our kids would be the ideal situation and he would be a great family dog. And at first, he was! He adored Tru most of all and they did so well together. My kids are very good with him, having been around dogs since they were born. No eye poking or tail pulling happening here! But unfortunately, Rocky’s temperament as he has grown up is vastly different than his puppy self and at this point, the kids are unable to play with Rocky much at all, although they still love him. On top of that, Rocky has a bit of temper than scares me. And I think he knows it. Ever since he was a puppy, he will growl when he doesn’t want to do what we tell him. For example “Go in the kitchen.” *Growl* When he was small, I thought it was odd but maybe just his little thing he did and no problem. But as he’s grown, it makes me very uncomfortable. I’m not super concerned for myself, but I don’t like that behavior around my small kids. The great thing about Rocky is, he’s an awesome watch dog! The day we brought him home, we could already see he was good at that as he was immediately watchful and protective. This is a good thing in most cases and something that I had actually hoped for. However, when we have people over, Rocky does this high pitched bark and growls and lunges at them. We tell him it’s ok but he doesn’t calm down. So we have to put him in his crate… Rocky is big enough at 45 pounds and extremely strong. He could do very serious damage to someone. Like I said, great for scaring off a burglar. But extremely scary when he was growling and lunging (and I could barely hold him back) at my sister and niece. Which brings me to his anxiety. He hates the crate for any purpose other than sleeping (he sleeps in it at night, door shut and everything, NO PROBLEM). He cannot be crated when we leave the house though because he will pull on the wires of the crate with his mouth and actually pulled the front of the (I bought the *heavy duty* metal!!) crate inwards when we left him for just one hour. We tried all the crating tips, gave him lots of treats and toys in the crate etc. But as soon as I walk to the door, he flips out and doesn’t stop till I come home. We have tried treating his anxiety with over the counter measures. Benadryl does calm him a little. Melatonin helps a ton! But it’s never going to cure the separation anxiety. Which I find odd because Rocky doesn’t even seem that attached to me in general, until I try to leave. And 1 final point, which is huge, but not enough reason to rehome a dog…. He is still not reliably house trained. That is to say, he IS house trained when he wants to be. But after a period of no accidents – even a couple weeks, he will start going in the house again. Generally he will just stand there and pee, looking right at us, and then run to the door to be let out. It’s aggravating to no end and I cannot find a way to stop this because I don’t understand why it happens. Anyway, all this is so much harder than I thought it would be and I just wish wish wish we could make it work and keep Rocky. I’ve really grown to love his good qualities and I guess it’s just hard to give up the relationship that I had hoped for with him. I know he will make the right owner so happy and that they will be able to give him a good life. And I so hope that whatever dog we end up adopting will be perfect for our kids. So, turns out that the loan officer who helped with our loan for our house almost 7 years ago is a crap ton busier nowadays. DH has been trying to contact him all week and has talked to the assistant (who knows absolutely nothing, apparently) multiple times but still hasn’t been able to get the actual loan officer on the phone. It helps that the LO covers two bank branches. And that we are coming up on 2 major holidays. 🙄 *sigh* It’s fine. I just really want to get the ball rolling since we only have just so much time in our contract and so much we need to get done in the meantime. Like having the septic at the new property inspected. And we still don’t know what kind of loan we can get because the house that is currently on the land is uninhabitable and we have to remove it before building. Which means we won’t be able to qualify for a conventional loan. Maybe a land loan? But that will require a seriously hefty down payment. We just really need to hear all our options and get the process started! All that aside, I have almost everything ready for Christmas. We didn’t decorate this year because, toddler. As it turns out though, Zane has hardly bothered the trees at any of our relatives houses. He broke one ornament on my MIL’s tree, but hasn’t bothered them otherwise. So, I think I’m actually going to put up our mini tree this weekend so I can put the boys’ presents under/around it. I still have 4 people I need to buy for. (I know. Absolutely ridiculous!) I have never in my life been this ridiculously behind. Thankfully, 3 of them are kids. Which makes it easier in my opinion. Anyway, I’m going to quit procrastinating and go pick away at my ever growing to-do list. Throw some motivation my way! Twelve days ago, my sister S announced she is getting married. This is super exciting and she’s incredibly happy. She will probably be moving to another country though, at least part time. That’s super hard for all of us to accept. But I’m still incredibly happy for her. My sister M and I took S for an impromptu lingerie shopping trip yesterday and I gotta say, it was mega fun!! THEN, my brother J gave his girlfriend an engagement ring yesterday! I don’t know when they’ll be tying the knot but, oh my goodness! I did not see that coming! I’m still kind of in shock but also very happy for him. And for her!! I need all the exclamation points right now!! Today, our offer on a piece of land was excepted. As in, pending getting a loan – which shouldn’t be a problem – we legitimately might be moving next year! And not just moving but also selling our home of nearly 7 years, building a new house and leaving familiarity and comfort behind. I’m excited and petrified. I love our home, but we see clear direction that it’s time to move. •Cotton dry mouth since a day or so before the bfp and extra thirsy because of that. •The dry mouth is starting to change over to metallic taste. •The last 2 days I have been really tired despite the fact that I'm sleeping much better than usual at night. I always sleep well the first trimester. •This morning my coffee was so gross that I didn't finish it. I thought something was wrong with it until I drank some water that tasted really weird and ate some deer jerky that was off. •So cold!! Cold all the time. Can hardly get warm. Especially my feet. •I keep having a lot of cramping in the evenings. That's about it for symptoms. I decided not to take anymore tests to see the progression as it mostly just gives me anxiety. I am super hopeful about my beta tomorrow!! I hope it's going up well and that my progesterone is a better level. Today Levi told DH "That's why God put a girl baby in Mommy's body. Cause we prayed and God put a baby in her body." I absolutely love this!! It makes me so happy. I've been reminding the boys that the baby might be a boy, but they are convinced God is giving us a girl. 😂 Honestly, I had hoped we could keep the baby a secret from them in the early weeks, but they are so stinking happy to know. We had a family party for DH's side of the family today and several people asked if we are planning to have another. I wanted to be honest but not share our news yet, so I just said "Yep! Definitely planning on it!" For years I've been close to DH's cousin M and she just pointblank asked "Are you pregnant?" because she could just see it on my face when she asked if we were ready to have another. Her and I both just burst out laughing as soon as she asked. To be honest, I really don't know why I haven't wanted to share immediately this time around. We usually do share within a few hours to a few days. But I just kind of felt maybe it would be less stressful having less people knowing and worrying. Previously, I needed their emotional support but I just feel really different this time. I'm not going to say it's an easy secret to keep, though!! And I'm really looking forward to sharing with everyone. I do think it's for the best right now to keep the pregnancy a secret. There is a whole lot going on in both DH's family and mine... weddings, people moving far away for their careers or new spouses... Good things mostly! But still, so much happening. I hope everyone will be understanding and not upset if we wait a bit to tell them. I am so hormotional!! I don't have a lot of symptoms going on right now.... Acne, queasiness mostly in the evenings, some mild crappiness.... But I am suddenly an emotional basket case and it isn't very pretty! When DH checked the mail, I got really stressed out because the mail carrier took my $20 check for stamps but didn't leave me a note or stamps or anything. For some reason, that really ticked me off, even though I know she probably just forgot. And she's super great, so she'll probably bring them tomorrow. And then I got stressed out about the dog, and getting a loan for the new property. But what really tipped me over the top was the fact that I really wanted meatloaf and I made it yesterday for supper. But it wasn't ready in time, so we ate a gross frozen pizza. And then I heated the meatloaf tonight and it was so bad!! I must have missed something I was supposed to put in it because it was bland as could be. And the potatoes were dry. And the carrots were still a little crunchy. And I cried. But mostly because I wasted calories on something so gross, 2 days in a row! Yes, I feel stupid now. First-world problems and all that.... 😖 I feel better now that I got the crying out of my system. Maybe I just needed to cry. Why Do We Get Every Stomach Virus Ever? *Boohoo alert… This is gonna be a whiny one. When we go out in public, (which isn’t more than twice a week during the cold and flu season) I wash their hands with sanitizer AND wipes as soon as we get back to the car. We are done going to storytime for the winter also, in an effort to stay well. You can see, that’s not working. When we go in stores, Levi sits in the front of the cart WITH A CART COVER, Zane stays in his carseat in the back of the cart, and Tru walks beside me. Seems like we’d be limiting our germ exposure, but no. I have a variety of essential oils that claim to fight germs and build immunity that I diffuse. Nothing keeps us from getting sick. WHAT AM I MISSING?! How do parents have kids in daycare and school that are sick less than my kids are? What is the secret? Every winter we have several colds and at least 2-3 stomach bugs. It’s too much! We spend so much time at home alone being sick and recovering. And as soon as we do venture back out of our house, no matter how careful I am, we get sick again. There has to be some way to stay well! Throw all your ideas at me, I’m desperate.